Mechanics of Materials is the uncontested leader for the teaching of solid mechanics. 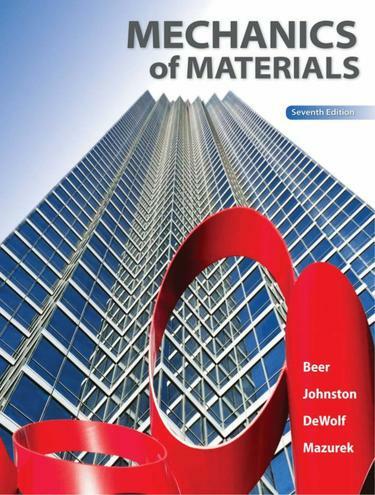 Used by thousands of students around the globe since publication Mechanics of Materials provides a precise presentation of the subject illustrated with numerous engineering examples that students both understand and relate to theory and application. The tried and true methodology for presenting material gives students the best opportunity to succeed in this course. From the detailed examples to the homework problems to the carefully developed solutions manual instructors and students can be confident the material is clearly explained and accurately represented.McGraw-Hill Education's Connect is also available as an optional add on item. Connect is the only integrated learning system that empowers students by continuously adapting to deliver precisely what they need when they need it how they need it so that class time is more effective. Connect allows the professor to assign homework quizzes and tests easily and automatically grades and records the scores of the student's work. Problems are randomized to prevent sharing of answers an may also have a "multi-step solution" which helps move the students' learning along if they experience difficulty.